Last week, while trekking around New York City, I was reminded of this graphic developed a couple of years ago by a clever and enterprising designer. He created a number of these images for iconic –non-train-related – subjects as a kind of ruse and way to get us to think differently than the status quo. As I rode the subway last weekend, I couldn’t help thinking about the things we take for granted in subways and how different that is for a river, and especially the Mississippi. As this map depicts, subways take the whole system into account. They’re designed and administered as systems. While the engineers who drive the trains only care about their line, a whole team of people looks at the whole system every day and oversees its interrelated functioning. 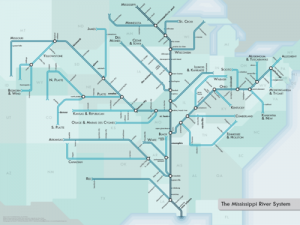 The Mississippi River, on the other hand, is managed according to its geographic sections. These sections, more often than not, were developed based on how long it took to ride or drive to a central point. Or they may have developed based on state and city boundaries already in place without regard to the nature of the river. They most certainly didn’t result from a common vision for how the river was to be sustained for a multitude of purposes. The other difference is that the Mississippi River is overseen by a multitude of interests: clean water interests, economic and community development interests, transportation, wildlife habitat, etc. If asked, you’d say, but subways only have to perform one function so they can be addressed as a system. However, in addition to providing transportation, subway systems have to comply with air and water regulations, they have community development purposes, whole neighborhoods’ economic well-being relies on their operation. Not so different from the Mississippi River after all. So the next time you take a train or stand beside the Mississippi River, think about the image above. I hope it will remind you that it is possible to approach America’s great waterway as a system and take all its important elements into account. What’s really standing in the way isn’t complexity or geography any more. It’s more a matter of political will.